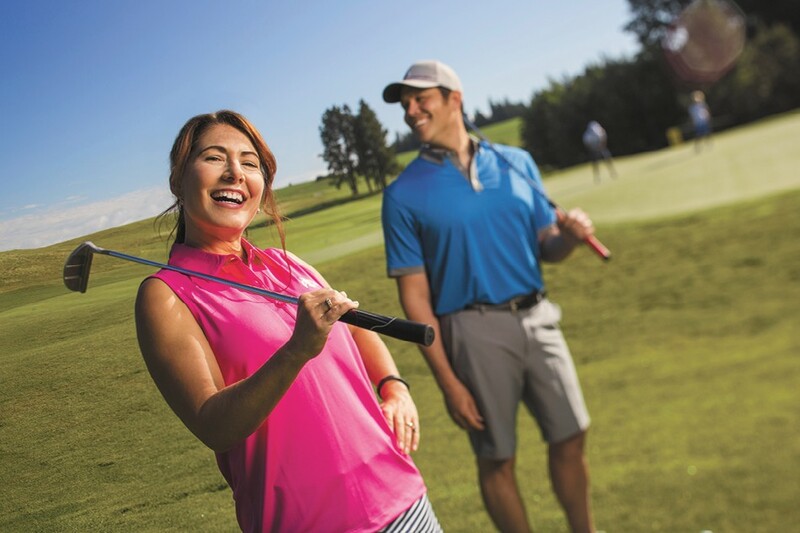 Circling Raven’s Mother’s Day Tee Party includes 18 holes of golf, a cart, brunch, and prizes. It’s May and that means one of the most important celebrations of the year: Mother’s Day on Sunday, May 13. We’ve got something for every special gal in your life: aunt, sister, cousin, daughter, gramma, Mom, wife or even a female friend. Surprise her with a beautiful hanging FLOWER BASKET, proceeds to benefit North Idaho AIDS Coalition, available May 10-11 ($35; 208-665.1448). Or paint your own flowers! Mom will love the time you spend creating a keepsake together at PINOT’S PALETTE. Visit their website for dates and painting options, including “Mimosas with Mom” on May 13 from 1-3pm ($35, plus beverages; pinotspalette.com, 208-930-4763). Why wait until Mother’s Day to spend a relaxing day downtown? Grab a cup of coffee and a spot along Sixth and Sherman for DOG D’ALENE (who says they’re “man’s best friend”?! ), a parade of pooches and other canine antics on Saturday, May 12, from 10 am-3pm (free; cdadowntown.com, 208-415-0116). Take in a few galleries like CISCO’S (ciscosgallery.com, 208-769-7575) or ART SPIRIT GALLERY, which is hosting an artist’s talk from noon-1 pm on Saturday (free; visit theartspiritgallery.com). Stroll into the Resort Plaza Shops for a complimentary glass of champagne and sweet treats during CUPCAKES & COCKTAILS, 11 am-3 pm (cdaresort.com, call 208-765-4000). Everyone likes to eat, so treat Mom to SUNDAY BRUNCH at the Coeur d’Alene Resort with an all-you-care-to-eat buffet at either Dockside or Beverly’s, or a 90-minute brunch CRUISE (cdaresort.com, 855-703-4648). Have lunch at CEDAR’S FLOATING RESTAURANT (cedarsfloatingrestaurant.com, 208-664-2922) or TITO’S ITALIAN GRILL & WINE SHOP (titoscda.com, 208-667-2782). For dinner, reserve your lakeside view at TONY’S ON THE LAKE (tonysonthelake.com, 208-667-9885) for an authentic Italian meal. Pack a lunch and a blanket for the Mother’s Day CONCERT IN THE PARK, from 2-4 pm at the City Park bandshell, courtesy of North Idaho College’s Wind Symphony and the Chambers Singers. Free. Or maybe mom would like a SPA DAY of pampering. Make an appointment at ZiSpa (zispas.com, 208-765-9400), the Coeur d’Alene Resort and Hotel (cdaresort.com/discover/spa, 855-703-4648) or the Coeur d’Alene Casino and Resort (cdacasino.com, 855-232-2772). Speaking of the casino, if Mom is feeling sporty, check out the casino’s special MOTHER’S DAY TEE GOLF & BRUNCH package, including brunch and 18 holes of golf ($80, cdacasino.com, 800-523-2465). But wait, there’s more. Specials include Mother’s Day discounts as the spa, a four-course meal at Sweetgrass Café and — for the first 1,000 moms on-site — a carnation and automatic 500-point bump in player’s points (facebook.com/events/ 277533689094867). This classic American musical tells the story of the people of Sweet Apple, Ohio. When recently drafted, rock ’n’ roll superstar Conrad Birdie comes to give one lucky American teenage girl a goodbye kiss before he is inducted into the Army. With the whole town caught up in the frenzy of Conrad’s visit, parents complain, girls swoon, boys fret and no one is left the same. Tickets $23-25; Friday, 7:30 pm; Saturday-Sunday 2 pm and 7:30 pm; Lake City Playhouse. Local and nationally acclaimed artists are on display all throughout downtown Coeur d’Alene during Art Walk, held the second Friday each month. Enjoy artists’ receptions, appetizers, wine and exceptional art as you move among 20 different galleries and shops. Free; visit artsandculturecda.org/artwalk for a map.